The midway was closed up tight on that fateful night of August 20, 1952. Cetlin Wilson Shows was playing the Missouri State Fair in Sedalia and most of the show’s people had turned in for the night. They didn’t feel the air go still as death, they never saw the lightning silhouette the massive funnel cloud that traced out a line of destruction along the ground like the finger of doom until it was on them causing destruction on the fairgrounds. At 1:20 A.M. it struck the midway in all its fury. The House trailers on the lot were tossed around like a spoiled childs toys. The rides were twisted into unrecognizable shapes and the big front’s, like Reynell’s beautiful girl show were turned into splinters and carelessly blown away. Canvas tops that weren’t blown completely away were turned into rags in that brief destructive instant. Before anyone knew what had hit them it was gone. Miraculously only one fatality was recorded on the show but as they stood in the driving rain observing the damage, everyone knew that the great Cetlin and Wilson Shows lay in ruins. For some the storm dealt a death blow they would never financially recover from destruction on the fairgrounds. 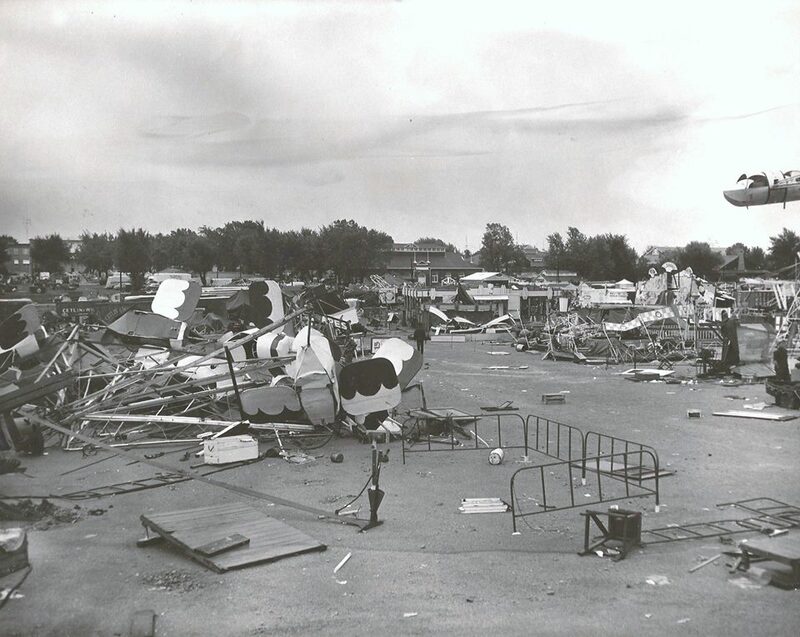 In addition, all the permanent buildings on the fairgrounds suffered extensive damage or total destruction. In keeping with the spirit of the old saying “the show must go on” the fair was open the very next night. Help and spare equipment began arriving from every show in the country. In typical ‘show biz’ fashion it wasn’t long before the show rose, like the mythical Phoenix from the ashes, to complete the season.